On Sunday, Arjo Atayde guested on Gandang Gabi Vice with Angel Locsin and JC De Vera, his co-stars in the new teleserye The General's Daughter. 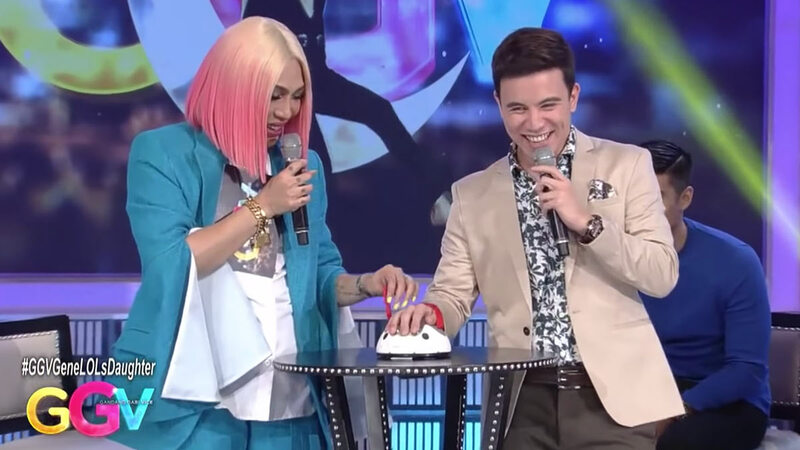 They played a game called "Kuryentanong," where Vice Ganda asked them questions, and all they had to answer was "yes" or "no." If the lie detector machine (aka a toy Polygraph) sensed that they were ~lying~, they'd feel a slight electric shock! Fun game, fun times. Vice first asked Arjo, "Mas magaling ka ba kay JC De Vera?" Arjo's answer was "no" and the machine said he was lying! The next question was, "Dakila ka ba?" This time, the machine decided that Arjo didn't lie when he said, "Yes." Vice Ganda's third and last question, the most controversial one of all, was, "Mag-jowa na ba kayo ni Maine Mendoza? Yes or no?" Amidst the squeals and screams from the audience, Arjo very seriously answered, "No." And guys, according to the machine, ARJO WAS LYING. We don't know what to make out of this! On one hand, it's a literal LIE DETECTOR TEST. But on the other hand, machines do make mistakes. ICYMI, Maine and Arjo have been the subject of dating rumors since October 2018. Maine put an end to these speculations in December when she said that they were just friends. The Kapuso star recently defended Arjo and his sister Ria Atayde from a basher who said that the siblings were "users" (SO HARSH)!